Is there a difference between pegs for 3/4 and 4/4 violin ? Hmmm.... Right.... 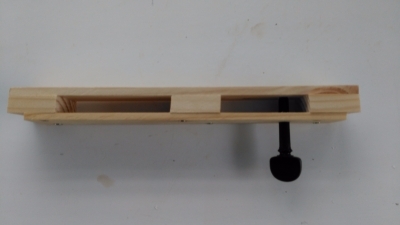 I have embarked on a little project which involves replacing the pegs on my e-bay fiddle. She's an old-lady, dating from around 1920 or so, and has been played a LOT ( you can tell ). Oh - and she has a 33cm back - i.e. 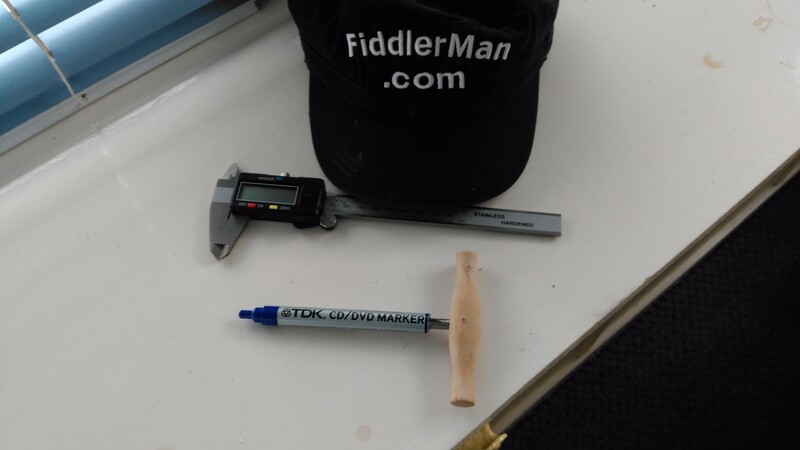 a 3/4 size fiddle. Soooo - I have the new pegs - I happened to choose boxwood pegs - and they are pre-tapered, but, obviously, oversize and need to be shaved down. I have a 30:1 taper reamer, and using that and a bit of careful measurement and the blade of a small plane, have fashioned a peg shaver. It IS a bit of a heath-robinson affair, and at the end of the day, I rather suspect I might just buy the proper instrument anyway. So I looked at some peg-shavers on the interwebby thing. Now - here's the question - something that had never occurred to me - there is a "suggestion" in the product details for the shaver I'm looking at, that there is a difference between pegs for a 3/4 size fiddle and a 4/4 size fiddle.... This I do not understand.... It could of course just be the way it is worded, and implies that the device is suitable for 3/4 and 4/4 fiddles ( implying that it is not suitable for, say a 7/8 or 1/2 size etc etc etc - but even THEN I wouldn't be sure why.... ) - it says this ( their caps ) - " WITH PRECISION STEEL BLADES THAT CAN BE ADJUSTED WITH THE SCREW ATTACHED. FOR A 4/4 OR 3/4 VIOLIN PEGS." EDIT: I slept-on-this and everything is fine. It was a definite case not seeing the wood for the trees - I had collected so much "research" on this and - the mechanics of doing it are absolutely straightforward, with sufficient attention to detail and care. I have absolutely no problem about actually doing the job. EDIT again - I just had to share this - I read of someone doing this, and, with all pegs removed, he started to ream out what he thought was the E string peg-hole. Uh-huh - the lowest hole on the E-string peg side is actually the far-end of the G peg....... this is NOT the hole he meant to ream out.... ended up having to fit a bush in the peg holes for the G !!! Easy done, but I'll bet it wasn't funny at the time ! It's always easy to remove wood but to put some back can be a bit more challenging. Errrr... yes ! Already put thought into this should it happen (or be required - although on initial inspection in spite of the holes having been already reamed sometime in the past I suspect there will be enough left to play with....) But yes, fingers crossed though..
Good luck Bill, it's satisfying doing a job like this on your instrument. Re the peg shaver, I would say if you can get one for a reasonable price do it - I used the improvised plane iron method to shave mine and it was a pain to get it adjusted right. If I had to do it again I might look at getting one (the main problem is if you get a cheap one from China the price is just over the threshold for VAT so you end up getting stung with a handling surcharge). Don't know the answer to the different sizes. Yes indeed - very satisfying - well it will be once done @Jim Dunleavy ! I think that the spiral bushing sounds like a great idea. Maybe not based on glue-impregnated craft-paper though. Ben is no longer with us. We now have Felix, Sean and Andres working as full time luthiers. Maybe I'll ask Sean to do it. As well as being the owner of a fine FiddlerMan Concert, I have an old (1920's) mass produced fiddle - it happens to be a 3/4 but that's not overly important. She has a nice loud voice and now she's properly set-up she sings quite nicely ! Anyway - the one down-side to this old fiddle are the tuning pegs and indeed the peg-holes. I am in the process of replacing and re-seating all the pegs - well - I haven't started yet - but I have the basic tools, 30:1 reamer and peg-shaver plus a few other small tools, and I believe I can do the job - it will be my first adventure into any form of "serious" luthiery other than having done things like adjusting bridge and nut height and sound post position. Now - my biggest problem with that would be - not having a vertical drill - would be lining up the starter-holes for the reamer, and I was investigating other approaches. 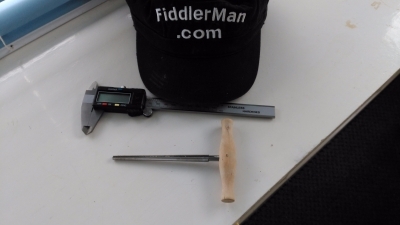 I have read about "spiral-bushing" - employing a very thin shaving of maple or other wood, shaped around a true 30:1 mandrel / existing new peg, and glued into the hole. I have even seen reference to this being done with craft-paper as well - and I understand the technique. I suspect you are both now shaking in your boots saying - "Arghhhh, no, don't even go there, Bill" - but nonetheless I seek your advice !!!! Just forwarded this to Felix. I'll also make sure he connects to the luthiers email. I spoke to him and forwarded this link but in the meanwhile, he prefers making dowels but wooden spiral bushings work fine if done properly. Yeah - this was my first ever "serious" DIY luthiery other than bridge carving and stuff like that - and I was intrigued by the concept of the spiral bushing. As it turned out - in spite of the quite extensive at-first-look-damage to the peg-box holes, they WERE salvageable with the reamer alone. Hahahaha - in some ways I was disappointed - I really wanted to try my hand at installing either a dowel or even a spiral bush. I may still do it - I have a heck of a lot of other things I'm working on at the moment - and - the 3/4 fiddle was only really bought to experiment with - so it's gonna be "open season" once I have more time on my hands ! Oh - yes - and by the way - welcome back ! I know it's a different thread - didn't get the chance to respond earlier - hope all goes well there !! !